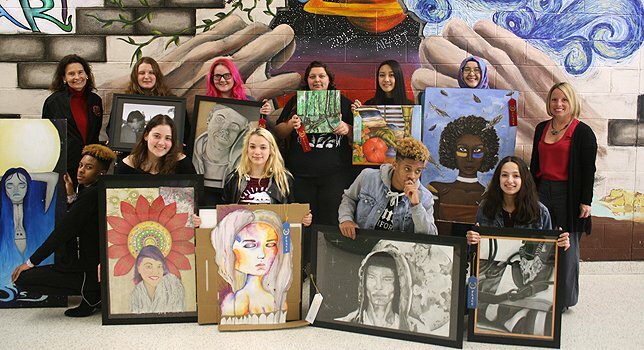 Recently, more than 90 students earned “Distinguished” portfolio ratings, the highest available, at the annual New York State Art Teachers Association Portfolio Project Adjudication. William Floyd High School student artists who were recognized at the Bay Area Friends of the Fine Arts exhibit. Mastic Beach, NY - May 11, 2017 - William Floyd student artists have been decorating the landscape of Long Island with their artwork with successful adjudications, exhibitions, competitions and more. Recently, more than 90 students earned “Distinguished” portfolio ratings, the highest available, at the annual New York State Art Teachers Association Portfolio Project Adjudication. William Floyd also had the most students it ever has receive a “perfect score,” which is an indication of a highly-effective and successful program. Students provided their professional portfolios that included a self-portrait, a cultural connection piece, drawing from life and several “student choice” pieces based on the level of each student. For the adjudication, students had to present their work and discuss the inspiration behind the pieces, as well as their visual choices. “Experiences like these help develop self-confidence and independence, while at the same time providing invaluable lessons for college and career readiness,” said Theresa Bianco, Chairperson, Visual Arts, William Floyd School District. Congratulations to all the students and their teachers Erin Almeida, Marco Antenucci, Jillian Berner, Theresa Bianco, Tina Eccleston, Linda Francis, Erica Licausi, Dale Luongo, Timothy Kosta, Susan Plunket and Stephanie Taisler! These students and their teachers were also invited to a Board of Education meeting to be recognized for their accomplishments. William Floyd had several winners in various categories at the annual Bay Area Friends of the Fine Arts (BAFFA) Student Invitational Art Exhibit held at the Gillette House in Sayville. William Floyd students won two first place ribbons: junior Jennifer Suarez for her drawing/charcoal, titled “Looking at Old Things Differently” and senior Victoria Lentz for her watercolor painting “Dreaming All The Time.” There were also three second-place winners: junior Seyma Ayyildiz for her oil painting on wood, senior Jasmine Edwards for her ceramic painting piece and senior Tatum Gross who created a beautiful portrait in charcoal; and three third-place winners, Traivon Trent, Tylee Trent and Madison Hangley, and Mrs. Susan Plunket’s painting student Dabney Villasenor who received an honorable mention. William Floyd student artists in grades kindergarten through 12 from all schools were invited to participate in a “nature inspired” exhibit at the Wertheim National Wildlife Refuge in Shirley. Wertheim kicked off the exhibition with a student reception and unveiling. More than 50 works of art in different mediums are on display in Wertheim’s educational room. Pieces include ceramics, Sumi landscape paintings, koi fish watercolors and detailed animal ink drawings. The artwork will continue on display throughout the month of May. Subject: LongIsland.com - Your Name sent you Article details of "William Floyd Student Artists Making their Marks Across Long Island"